I own a 2002 2500. The brake line is leaking somewhere behind the fuel tank. I know this because if I pump the brake pedal a river of brake fluid flows out all over the fuel tank. It's impossible for me to pinpoint the exact location with the fuel tank in the way. 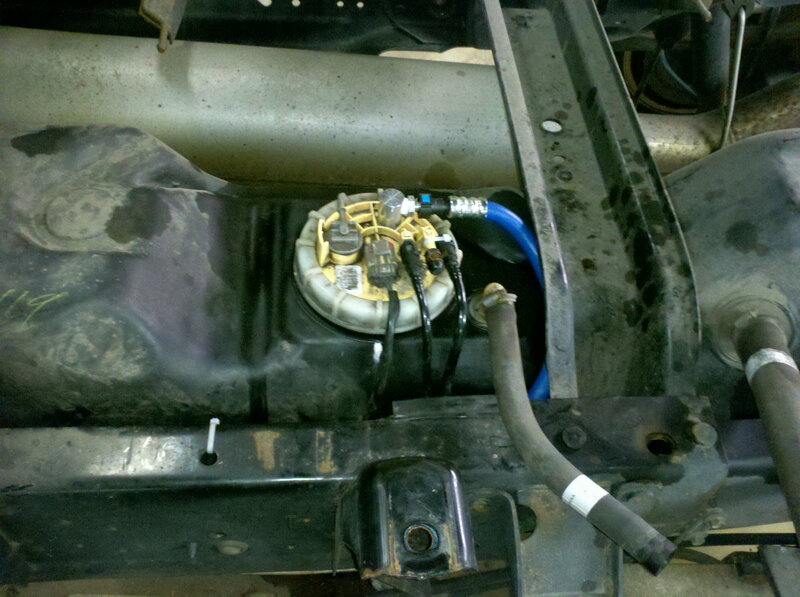 My question is in order to repair the leak, I have to drop the fuel tank, or remove the bed and cap. The third option is sell the truck. What is easier, to remove the bed and cap or drop the tank. Option three is open if you are interested, we'll talk. Thanks. 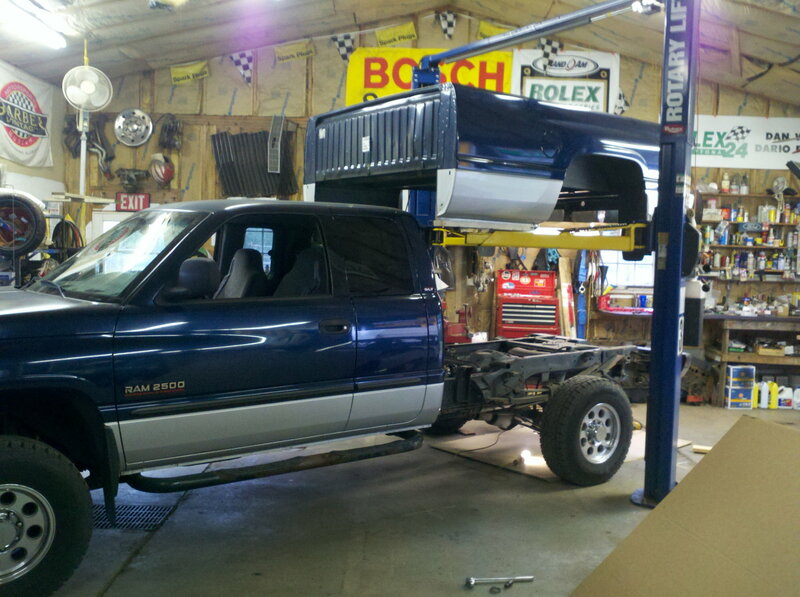 For $20 - $30 in Brake lines, you're going to sell the truck ? For me, it was easiest to drop the tank. That would also be dependent on how full it is. Siphon the tank near empty, get a floor jack out. Put a piece of wood (2x 10) or equivalent under the tank, remove the tank strap bolts, remove the filler neck, slowly lower the tank and disconnect the fuel lines. If the tank is already empty, should take you about an hour to get it out if you're super slow and careful. or pay the $250 to pay someone else to do it. Yo can't just fish a new line through?. That's what I've always done. There you go. I always tape over the end of the replacement line, shove her thru, and then zip tie the new line to the old one in front and behind the tank. About an hour start to finish for whole job. IIRC a 72" stick and a 30" stick was about right for a 2nd gen extended cab. Where is truck and how cheap can I buy it? Like everyone said, just fish it through. I also have a '02 2500 and the stainless hard line kit was worth every penny. It fit perfectly and came with everything except the front two soft lines. It does come with rear braided hoses for the rear disc brakes (but nothing for the front). First, sorry but I have no idea about a 2002 model truck. But with an a-frame to hoist the bed I can pull and replace the bed on my truck in a couple of hours. If really very simple. 8 bolts, filler neck screws and tail light plugs. tank and the rail so it doesn't make it that much easier to get to. You spend more time bending/flaring the line and figuring out what length to make it then you will actually replacing it. It might help make it a little easier to access the bend/connection where it goes to the soft line on the frame rail at the rear end of the tank. Thanks everyone, I'm going to attempt pushing it through first. The dropping the tank option sounds easy, but I've almost a full tank of fuel, (about 30 gals), and not enough containers to store the fuel while dropping the tank. Thanks again for all the advice, I'm going with the stainless tubing. Rear hard line brake line. New brake line, now abs and brake light on? help!! brake line leaking and no more brake fluid!! !